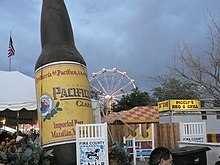 Pima County /ˈpiːmə/ is a county in the south central region of the U.S. state of Arizona. As of the 2010 census, the population was 980,263, making it Arizona's second-most populous county. The county seat is Tucson, where nearly all of the population is centered. The county is named after the Pima Native Americans who are indigenous to this area. Arizona's location within the U.S.
Pima County includes the Tucson, Arizona Metropolitan Statistical Area. Pima County contains parts of the Tohono O'odham Nation, as well as all of the San Xavier Indian Reservation, the Pascua Yaqui Indian Reservation, Organ Pipe Cactus National Monument, Ironwood Forest National Monument and Saguaro National Park. The vast majority of the county population lies in and around the city of Tucson (2011 city population: 525,796), filling much of the eastern part of the county with urban development. 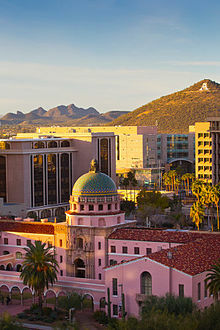 Tucson, Arizona's second largest city, is a major commercial and academic center. Other urban areas include the Tucson suburbs of Oro Valley (population 41,335), Marana (population 35,232), Sahuarita (population 25,458), and South Tucson (population 5,695), a large ring of unincorporated urban development, and the growing satellite town Green Valley. The rest of the county is sparsely populated; the largest towns are Sells, the capital of the Tohono O'odham Nation, and Ajo in the county's far western region. Pima County, one of the four original counties in Arizona, was created by the 1st Arizona Territorial Legislature with land acquired through the Gadsden Purchase from Mexico in 1853. The original county consisted of all of Arizona Territory east of longitude 113° 20' and south of the Gila River. Soon thereafter, the counties of Cochise, Graham and Santa Cruz were carved from the original Pima County. According to the U.S. Census Bureau, the county has a total area of 9,189 square miles (23,800 km2), of which 9,187 square miles (23,790 km2) is land and 2.1 square miles (5.4 km2) (0.02%) is water. The Sonoran Desert Conservation Plan (SDCP) is Pima County’s plan for desert conservation. As of the 2000 census, there were 843,746 people, 332,350 households, and 212,039 families residing in the county. The population density was 92 people per square mile (35/km²). There were 366,737 housing units at an average density of 40 per square mile (15/km²). The racial makeup of the county was 75.07% White, 3.03% Black or African American, 3.22% Native American, 2.04% Asian, 0.13% Pacific Islander, 13.30% from other races, and 3.21% from two or more races. 29.34% of the population were Hispanic or Latino of any race. 22.80% reported speaking Spanish at home. There were 332,350 households out of which 29.20% had children under the age of 18 living with them, 47.70% were married couples living together, 11.80% had a female householder with no husband present, and 36.20% were non-families. 28.50% of all households were made up of individuals and 9.40% had someone living alone who was 65 years of age or older. The average household size was 2.47 and the average family size was 3.06. In the county, the population was spread out with 24.60% under the age of 18, 10.90% from 18 to 24, 28.40% from 25 to 44, 21.90% from 45 to 64, and 14.20% who were 65 years of age or older. The median age was 36 years. For every 100 females there were 95.70 males. For every 100 females age 18 and over, there were 92.70 males. The median income for a household in the county was $36,758, and the median income for a family was $44,446. Males had a median income of $32,156 versus $24,959 for females. The per capita income for the county was $19,785. About 10.50% of families and 14.70% of the population were below the poverty line, including 19.40% of those under age 18 and 8.20% of those age 65 or over. As of the 2010 census, there were 980,263 people, 388,660 households, and 243,167 families residing in the county. The population density was 106.7 inhabitants per square mile (41.2/km2). There were 440,909 housing units at an average density of 48.0 per square mile (18.5/km2). The racial makeup of the county was 74.3% white, 3.5% black or African American, 3.3% American Indian, 2.6% Asian, 0.2% Pacific islander, 12.3% from other races, and 3.7% from two or more races. Those of Hispanic or Latino origin made up 34.6% of the population. Of the 388,660 households, 29.8% had children under the age of 18 living with them, 44.5% were married couples living together, 12.8% had a female householder with no husband present, 37.4% were non-families, and 29.2% of all households were made up of individuals. The average household size was 2.46 and the average family size was 3.06. The median age was 37.7 years. The median income for a household in the county was $45,521 and the median income for a family was $57,377. Males had a median income of $42,313 versus $33,487 for females. The per capita income for the county was $25,093. About 11.2% of families and 16.4% of the population were below the poverty line, including 22.6% of those under age 18 and 8.5% of those age 65 or over. The United States Office of Management and Budget has designated Pima County as the Tucson, AZ Metropolitan Statistical Area. The United States Census Bureau ranked the Tucson, AZ Metropolitan Statistical Area as the 53rd most populous metropolitan statistical area of the United States as of July 1, 2012. The Office of Management and Budget has further designated the Tucson, AZ Metropolitan Statistical Area as a component of the more extensive Tucson-Nogales, AZ Combined Statistical Area, the 53rd most populous combined statistical area and the 59th most populous primary statistical area of the United States as of July 1, 2012. Pima County is governed by a five-member Board of Supervisors who set ordinances and run services for the areas that do not fall within any city or town jurisdiction. The Pima County Board of Supervisors is responsible for steering public policy in the region. The five-member board provides direction to the County Administrator and the county’s various departments as they work to ensure safe communities, nurture economic development, sustainably manage natural resources and protect public health. In addition to overseeing the delivery of a host of municipal services, from roads to parks and libraries and law enforcement, board members also are responsible for approving the county budget. Elected to four-year terms, board members also set the amount of taxes to be levied. Along with the Board of Supervisors the Arizona State Constitution allows for 7 other county elected officials. The Pima county sheriff's department provides court protection, administers the county jail, provides coroner service, and patrols the unincorporated parts of Pima County. It is the seventh largest sheriff's department in the nation. Incorporated towns within the county with municipal police departments are Tucson, Marana, Oro Valley, and Sahuarita. Map of the incorporated and unincorporated cities and towns in Pima County. Also shown are the borders for the Indian Reservations in the county. Astronaut photo of the open-pit copper mines adjacent to Green Valley, 2010. Note that north is to the left. The population ranking of the following table is based on the 2010 census of Pima County. Wikimedia Commons has media related to Pima County, Arizona. ^ Wagoner, Jay J. (1970). Arizona Territory 1863–1912: A Political history. Tucson: University of Arizona Press. p. 58. ISBN 0-8165-0176-9. ^ "2010 Census Gazetteer Files". United States Census Bureau. August 23, 2012. Retrieved August 23, 2015. ^ "U.S. Decennial Census". United States Census Bureau. Retrieved May 18, 2014. ^ "Language Map Data Center". Mla.org. 2013-04-03. Retrieved 2015-10-11. ^ "DP02 SELECTED SOCIAL CHARACTERISTICS IN THE UNITED STATES – 2006-2010 American Community Survey 5-Year Estimates". United States Census Bureau. Retrieved 2016-01-20. ^ "Board of Supervisors - Pima County". Pima.gov. 2013-04-16. Retrieved 2015-10-11. ^ "Office of The Pima County Assessor". asr.pima.gov. Retrieved 2017-01-23. ^ "Pima County Attorney". pcao.pima.gov. Retrieved 2017-01-23. ^ "Pima County Recorder's Office - F. Ann Rodriguez". recorder.pima.gov. Retrieved 2017-01-23. ^ "Meet the Superintendent - Pima County Schools - Tucson, AZ". schools.pima.gov. Retrieved 2017-01-23. ^ "Pima County Sheriff's Department :: Welcome from Sheriff Napier". editorialmac.com. Retrieved 2017-01-23. ^ "Home". to.pima.gov. Retrieved 2017-01-23. ^ "Home". cosc.pima.gov/. Retrieved 2017-01-23. ^ "Dave Leip's Atlas of United States Presidential Elections". Retrieved 2011-06-11. ^ Center for New Media and Promotions(C2PO). "2010 Census". census.gov. ^ Geographic Products Branch. "2010 Census Block Maps - Geography - U.S. Census Bureau". census.gov.